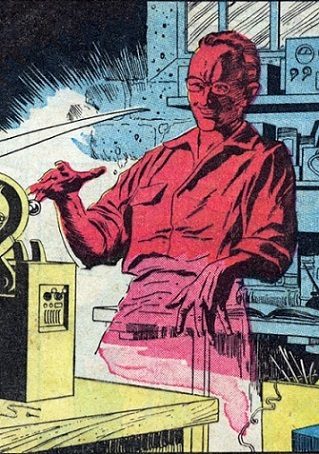 Powers/Abilities: None, but with the aid of his dematerializing machine, Sloan was transformed into an invisible, ethereal state and could possess other's bodies and dominate their wills. 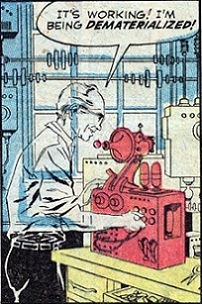 History: (Strange Worlds#4/4) - In 1967, after ten years of work, Sloan completed his dematerializing machine. 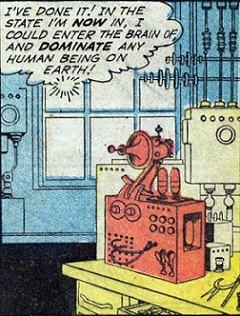 The device rendered him incorporeal, and only his invisible essence remained. 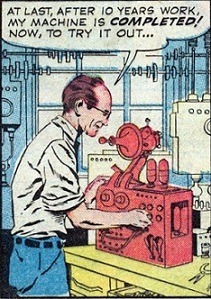 After testing the device and returning to normal, Sloan devised his great scheme. Dissatisfied with his own life, Duncan Sloan decided to use the machine to become other men...the wealthiest, handsomest, or the most powerful! Flying to Cannes, Sloan checked into a hotel room, then transformed himself with the machine. Drifting out to the beach, he came upon multi-millionaire Emerich Fabius laying in the sun and enjoying the company of two beautiful women. Taking possession of Fabius, Sloan was ready for the time of his life, when suddenly Fabius's accountant came running out, telling him that he was on the verge of financial ruin. Deciding that Fabius would have too much trouble ahead of him, Sloan left his body and returned to normal. Next flying to Hollywood, Sloan transformed again and took possession of movie star Vincent Stalwart. But when he was nearly killed by one of Stalwart's jealous ex-lovers, he thought the life of a movie star wasn't exactly what he wanted. Finally thinking, "This time I'll pick a guy too influential to go bankrupt, and too smart to be shot by a jealous dame! ", Sloan flew to South America and took over the life of dictator Alfonso Galvez, his third victim, but before he had a chance to do anything, a revolution began which threw Galvez out of power, forcing Sloan to leave Galvez's body -- "Again I picked the wrong guy!!" 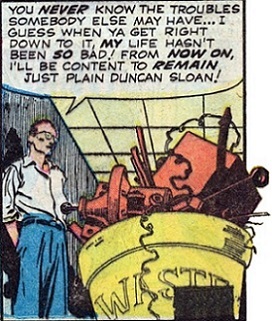 Deciding that three failures were enough for anybody, Sloan returned to his lab, trashed the machine, and thought maybe his own life wasn't so bad after all -- "From now on, I'll be content to remain just plain Duncan Sloan!" Comments: Created by an unknown writer and Al Williamson. I didn't see any reason why this story was set in the "future" year of 1967 -- probably just to give it a "futuristic" kind of feel. A device Sloan created which could transform him into a ghostly, ethereal form. 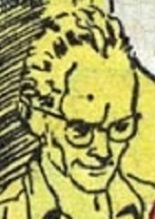 While in this energy form, Sloan could possess others, and he could rematerialize back to his normal state if he moved a set distance from the device's infragamma rays. It is unknown if this device could work on other people. The wealthiest man in the world, he was vacationing on the beaches of Cannes when he became the first victim of Duncan Sloan. But shortly after Sloan possessed him, he received news that he was financially ruined. Seeing that Fabius had too much trouble ahead, Sloan willingly left him for his next victim. A rich, handsome movie star, Stalwart was enjoying a romantic interlude with one of his girlfriends when he became the second victim possessed by Duncan Sloan. But things went awry when "Stalwart" was shot by another jealous girlfriend who didn't like the idea of him "two-timing" her. Sustaining only a flesh wound to his arm, Sloan decided that the life of a movie star was not for him, so he moved on to his next victim. President Alfonso Galvez was the most powerful dictator in South America, so Duncan Sloan made him his third victim. But shortly after taking over Galvez's life, rebels attacked Galvez's regime, forcing Sloan to abandon Galvez to save his own life.